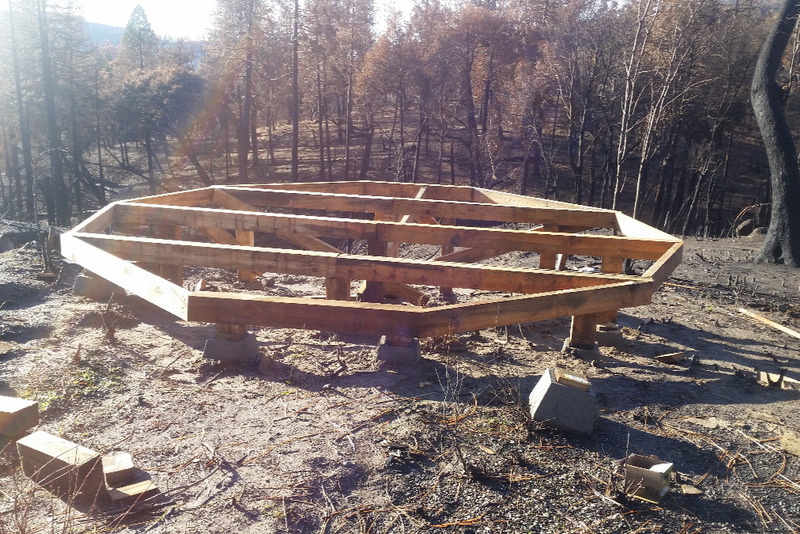 On site emergency construction of yurt shelters made with lumber materials saw milled from salvaged trees at or nearby area impacted by the Camp Fire. The final product will be a tangible, easily portable yurt shelter that will be owned by fire victims that participate in building their temporary home. Providing a hands-on experience instilling a vision leading towards a means to an end of this traumatic shift into homelessness. 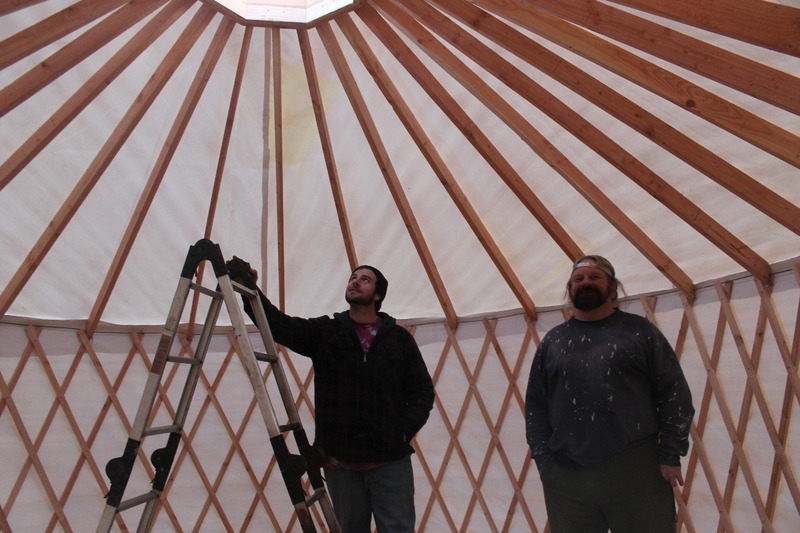 Need a yurt or want to learn how to build a yurt? Please fill out this form . Watch the 1 minute video below to see a six hour project at Donner Pass in CA. 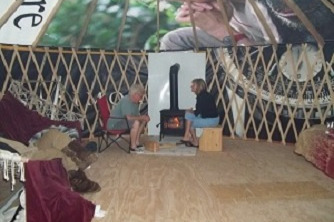 Handmade yurts provide a method for fast construction of easily portable shelters where fire victims can participate throughout the yurt building process. Many simple tasks can be performed by family’s and groups with a minimal level of instruction for non-complicated assembly process. Skilled carpenters are needed to help build the more complicated components, and also teach (leadership skills) and coordinate the participants / volunteers in simple tasks. Using a portable sawmill I can mill logs from or nearby the affected area to make lumber and build temporary portable emergency shelter. I can teach and oversee the assembly of yurts on site in a timely manner. With a well organized teem of volunteers and yurt recipients a typical day would go something like this; starting in the morning making lumber, processing parts and assembling wall sections, hubs and rafters. 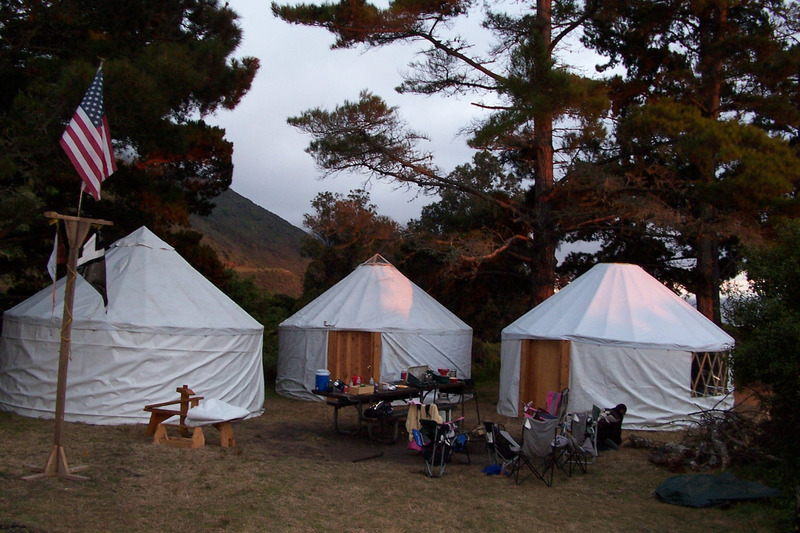 By the end of the day numerous 16- and 20-foot diameter yurts can be ready to deliver and occupy. The wall and rafter material can be milled and assembled right away while the hub will need dry wood to build. Canvas can be sized and fitted on site. I will teach anyone interested the skills needed to replicate the process with or without store bought materials. My goal is to help fire victims provide themselves with affordable (or free with your help) emergency portable shelter that will be as safe and comfortable as possible for the winter season that is already upon us. Below; milling sixty thousand board feet of lumber in Big Bend, CA. Please note: We are now transitioning into the second part of phase two! Phase one is just a first step towards a larger scale effort to help provide emergency shelter for displaced families and individuals from the Camp Fire. We are working with local Charity groups that are seeking an initial recipient family with access to a stable location (or not) to deliver the first yurt. I will Donate a 16 foot yurt and a new Natures Head self contained composting toilet with delivery and set-up. 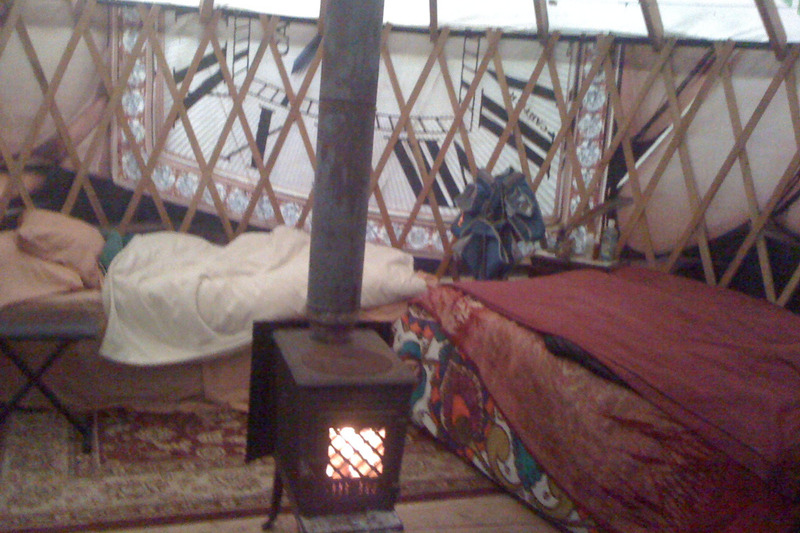 I will have one yurt ready to deliver and set-up December 3rd. There are two ways of implementing phase two and they can be done one at a time or at the same time. 1. One is to purchase all raw materials and start assembling where the emergency shelter refuges are located now, providing Portable Emergency Shelter from winter immediately. Example; All materials can be store bought and delivered on location. A complete 16 foot yurt about $500. in materials. Self contained composting toilet $900. brand new. It can be set up on the ground. One day project with small work crew to build and set up. Floor materials run about $800. and take about 12 work hours (two people 6 hours). With a budget that accommodates purchase of all materials and a team of volunteers and recipients we could shelter many family's in a short period of time. 2. The best case scenario is to be able to set up a sawmill site stocked with Pine, Fir, Cedar or other suitable logs (could be delivered) where we can mill lumber, build and assemble yurts and camp in yurts all at the same location. Or near the fire victim shelter areas as appropriate for milling and assembly . Until the second phase location can be secured and supplied with logs I am able to deliver one yurt ASAP. Once I am on site I can help assemble and train teams of volunteers/recipients and coordinate the implementation of this project. I have enough canvas and hardware to complete a small number of yurts to begin phase two. If there is a demand for this type of portable emergency shelter additional canvas will need to be ordered and shipped, all other hardware (and lumber) can be resourced locally. The overall size and length of the project will depend on many factors such as how many people will want this type of help verses the resources supported by volunteer Mission Teem members willing to donate their time and financial resources. Shelter locations, sawmill and construction worksite location and log resources that are readily available will play a factor in overall timing and effectiveness. Wood floor and wood burning stove for heat in Grass Valley, CA. Timing and financial resources will limit the amount of yurts that can be built before Christmas. I am currently looking to secure a suitable location that is safe to occupy for a “Sawmill/Work Camp”. 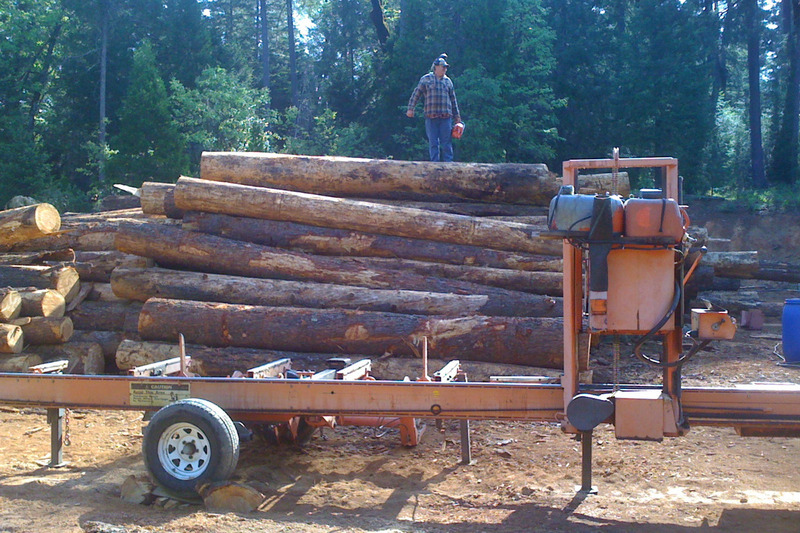 Logs such as Pine or Fir should be readily available or delivered to the shelter/sawmill site. Contact me if you would like to participate on any level. Yurts used as temporary portable emergency shelters can provide a timely solution as the winter season settles upon us now. There is a percentage of fire victims that will be able to procure a stable location to set up and live for an extended period of time, and others may need to relocate as necessary. The end goal is the restoration of independence and dignity to those affected with the traumatic loss from the Camp Fire. Some may end up in a yurt for many years, using this opportunity as a stepping stone towards recovery and reconciliation. Five feet of snow at Donnor Pass, CA. Genghis Khan's army traveled the world in yurts! I have been building yurts over 20 years for many family's who live in them year round. 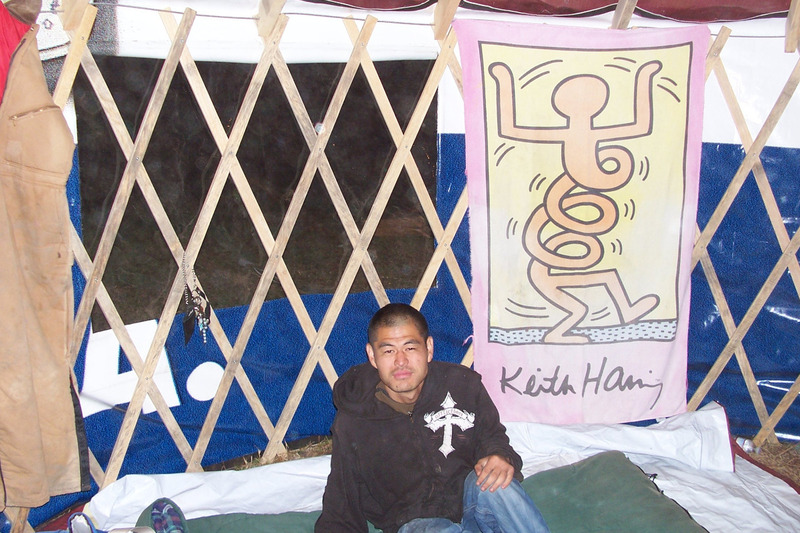 All videos and photos are yurts I have built. I am actively working with our VVA (Vietnam Veterans of America) Sonora Chapter #391 who is working with the local VVA at he Camp Fire location. We are also establishing ties with locally affected area churches to coordinate this project. If you would like to be part of this team please contact me. There is great potential to help the displaced Camp Fire victims right now. We are committed to use all funds, to the best of our ability to help as many of the Camp Fire Victims as possible. Donations and volunteers are needed, and with your help we can make this happen. I do not have a Facebook account to be verified by this website, so please share this link with your friends! Please Note: We are now transitioning into the second part of phase two and need continued financial support to meet the needs and requests for assistance. Camping in Big Sur, CA. Camping at fairgrounds in Nevada City, CA. More permanent set up on wood floor in Big Bend, CA. 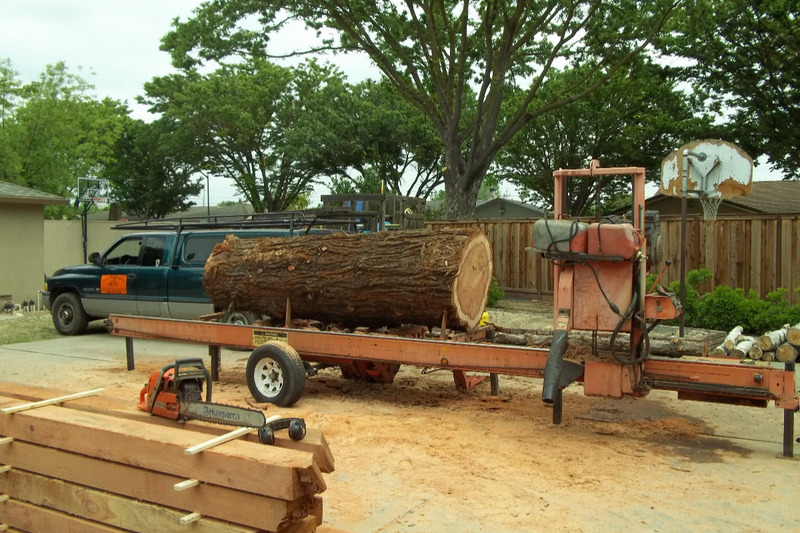 Portable sawmill making beams in backyard of home in Woodland, CA. Milling in Twain Harte, CA. During the week of February 11th, Camp Fire Emergency Shelter Project gifted a yurt to a veteran and his family. This yurt went to Concow with a wet winter start and a warm sunny afternoon finishing it up. Because we had help with the yurt set-up from family and neighbors, this was a community effort for this yurt raising. As a result, there is a growing knowledge in the Concow area about building yurts and setting them up. We had a few laughs and many smiles before this set-up project was over. 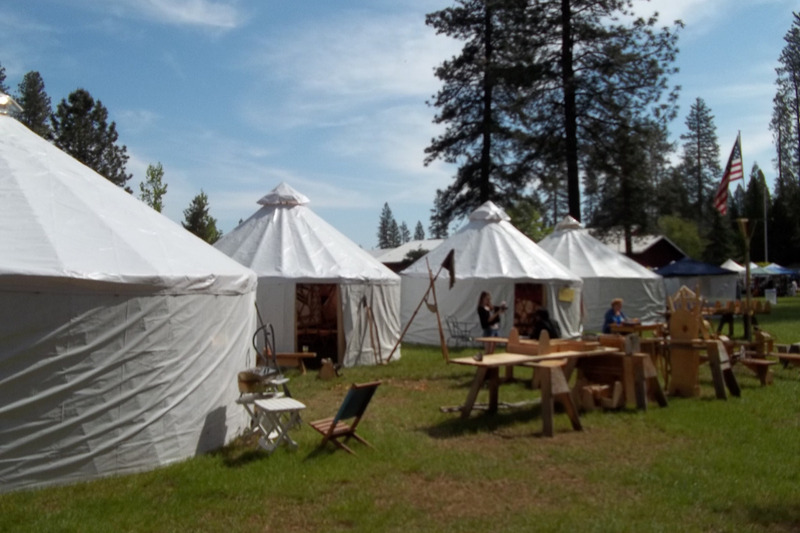 The Camp Fire Emergency Shelter Project will finish off March with a yurt workshop scheduled for the 26, 27 and 28. Starting the week in Migalia building a second yurt at this site. These will be occupied by two veterans who have been struggling with fema and need a secure place to live where they can participate in their own rebuilding process. In April I will bring the Sawmill to Concow and begin phase two of the Emergency Shelter Project. It has been several months in the making but finally the locations have been secured, the information is getting out. The process has taken hold. It is noteworthy that we now have a growing list of interested people who have lost everything and are excited to learn and build yurts. The sawmill will make a big difference in our ability to help greater numbers of people rebuild and recover from the Camp Fire. 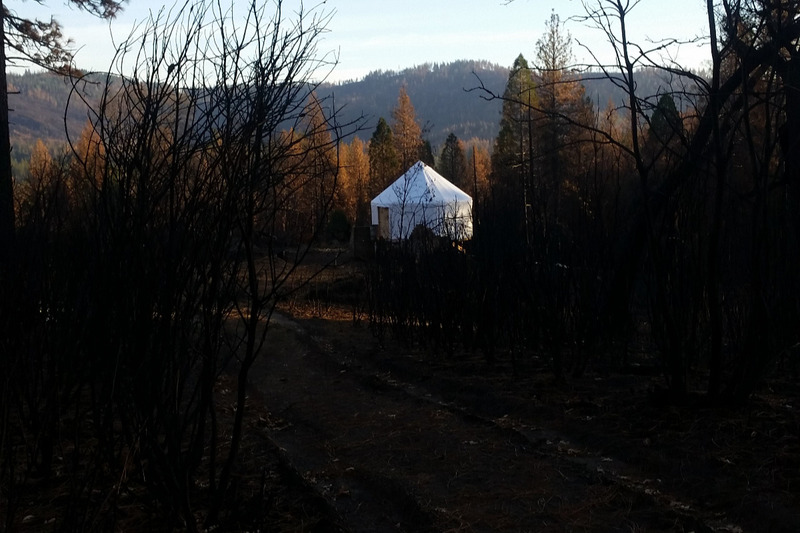 Furthermore the Yurt Workshop provides a hands on approach to recovery and rebuilding after the Camp Fire. Through the Yurt Workshop we will continue to produce more yurts that will be used for emergency shelter. To attend a workshop please see the Events Calendar at http://campfireyurts.com for upcoming workshops in Migalia and Concow. Register for a workshop to receive details about exact locations and times. Contact us for information about how you can help. It was a wet end for February with a soaking like I haven’t seen for a long time. Best snow pack for a few years. Got some good photos (below) of the river going over the road to one of the yurt sites. Weather will play a big part of the schedule during the rest of this winter. Yurt Workshops Now Scheduled for March and April. The Yurt Workshop calendar with schedule and registration is up and is posted on the new http://campfireyurts.com web site. You can find the latest updates along with all previous posts about the Camp Fire Emergency Shelter Project on the new website. Recovery and rebuilding after the Camp Fire presents an unique opportunity to participate in all aspects of the yurt building process. Everything from pre-assembly of all yurt parts including canvas, floor construction and yurt set-up will take place on a regular basis. All yurt workshop classes are held at different locations directly tied to recovery from the Camp Fire. The intention of this workshop is to provide a learning experience for individuals to recover themselves, at the same time as contributing to strengthen and rebuild the community as a whole. Everything from portable saw-milling the raw materials to finished yurts are skills that provide a sustainable method for rebuilding a community. All participants will have different needs along with limited time, resources and abilities. For this reason, all classes will have a focus on teamwork and long-term goals. Family, friends and groups work well with this in mind. All are invited to be a part of this team effort. I will be in Chico for a week at a time as I am able. Many factors play a part in the schedule. We are currently scheduling floor builds and pre-assembly of different yurt components such as doors, canvas and hubs. There will be several on-site locations around the County for floor builds and set-up (a one-day project with hands on skills). Pre-assembly of yurt components will also be taking place in Chico for now. 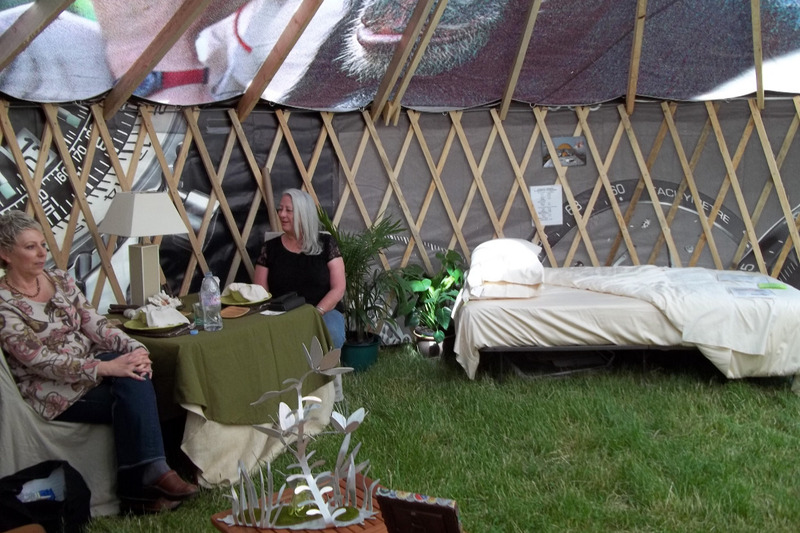 We are gifting some participants complete yurt packages sponsored by donations of cash, donations of materials and volunteers who just want to lend a hand up. Participation in this multi-faceted process is encouraged and requested if you are able. Yes, I am still here. Thank you everyone for your support and patience. Things never seem to come together as quickly as I would like. There was about a three-week period that I was committed to another schedule and was not able to get back in the Chico Paradise area until last week. During that time we were able to complete one floor build and yurt set-up at Adams place in Migalia (right next to Paradise) where we are set to place ten yurts in total. The lead-up to this first of ten at this location has been a slow process but we now have the first yurt in place there with plans for nine more along with a bath house. I hope to have two veterans in yurts by the end of this coming week. Weather will play a significant part of this schedule. A big thanks to all who have helped us to get this far along. We are making more contacts on a regular basis but are in short supply of volunteers right now. I think this will improve with time. There have been many donations of supplies such as generators, propane heaters blankets, cots and other items for personal needs that are being distributed by Corina Dixon in Chico. I have four composting toilets in addition to the two that have already gone out. We have received finical support to get us this far and have several yurts ready to place on floors as soon as we are able, according to each individual situation. We have many materials ready and on hand to keep things rolling. However additional financial support will be needed soon. At this point we are close to accomplishing the original short-term goals set out at the beginning of this project and are now looking into setting long term goals that reflect on what we have learned so far. We have not made a significant effort to advertise or spread the word about what we are doing but will step it up as we complete the short-term goals. It is my hope that the track record and accomplishments we have made will serve as motivation for greater participation and support in the future. There are many in need and much to be done. Helping others is not only good for them and a good thing to do, it also makes us happier and healthier too. Giving also connects us to others, creating stronger communities and helping to build a happier society for everyone. And it's not all about money - we can also give our time, ideas and energy. I will post more details and photos as they come in. All help and support are greatly welcomed. 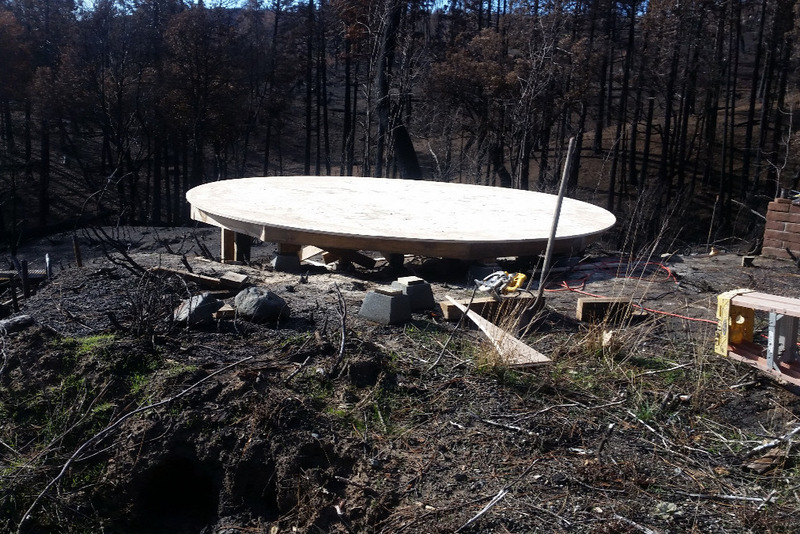 During the week of January 7th another floor was built, and a yurt went up in the Concow area of the Camp fire, new photos below. I went through Paradise and into Magalia where I was able to finalize plans for three yurt floors w/yurts that will be built the first week of February. One of these will go to a veteran, one to a single mother and the third for someone who will provide help for construction and upkeep of this location. We have also connected with a church that will get a floor and a yurt for a displaced veteran in Concow. More volunteers are expected for the next push in February. There are more displaced people that are finding out about what we are doing and the need for this type of emergency shelter is growing. This project will continue to grow through 2019.